Throughout its history, Mexico City has had two women in charge of the Government. The first was in 1999: Rosario Robles was in charge of the government of the Mexican capital, appointed to replace Cuauhtémoc Cárdenas, who was running for a third presidential candidacy. Today, December 5, the Administration of the city returns to the hands of a woman, but unlike Robles, the new mayor was elected by popular vote on July 1. 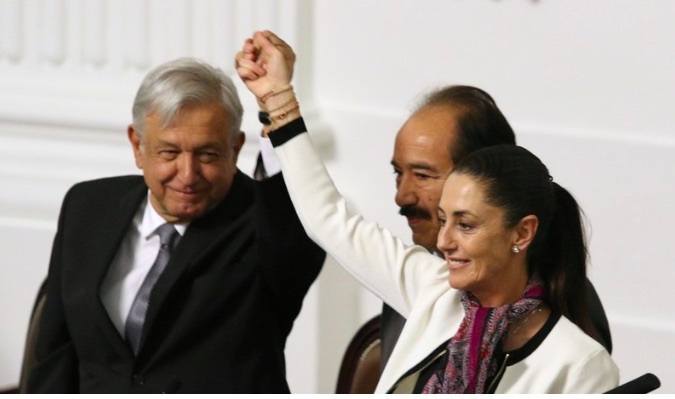 This is Claudia Sheinbaum Pardo, who, in addition, during her inauguration was accompanied by the president of Mexico, Andrés Manuel López Obrador, who is seen as her ‘political godfather’. Sheinbaum, 56, a professor and PhD in Energy Engineering, has said that her government will be based on 12 main axes: austerity; open democratic government with zero tolerance for corruption; mobility; security; reconstruction of the city, as well as the improvement of the supply of drinking water. Not only for those who voted for us, I am going to lead an honest, open, democratic, austere, inclusive government that acts with, for and for the citizenship, without distinction of party, religion or socioeconomic level, but putting all our effort to make of this, a city of rights, with justice and that diminishes the still serious social inequalities,” said the new mayor who has a degree in Physics, as she took the oath of office. Her main campaign promise was to end corruption, which – based on her estimates – will mean a saving of 25,000,000,000 pesos. One of the main announcements made this day was the abolition of the body of grenadiers, a security group that has been associated with various human rights violations in Mexico City; the members of the body will be added to other corporations and civil protection tasks. “I am very pleased, because Claudia Sheinbaum is a woman with convictions, she is an intelligent woman, she is an honest woman and she is going to make a good government,” said the president of Mexico, prior to the scientist’s installation as mayor. When he was the Head of Government of the then Federal District, between 2000 and 2005, Lopez Obrador appointed Sheinbaum Secretary of the Environment, a period in which important infrastructure was built for cars in Mexico City. During the campaign they were attacked by their political adversaries with regard to this. Sheinbaum was also a spokesperson for the failed presidential candidacy of López Obrador in 2006, accompanying him later when he left the Democratic Revolution Party (PRD) to found the National Regeneration Movement (Morena), a party that took her to the head of the Government of the mayor of Tlalpan in 2015, where she had to cope with the collapse of a school in the earthquake of September 19, 2017, which left a balance of 19 children and seven adults dead. Less than three months later, on December 5, 2017, Sheinbaum left office as head of the then Tlalpan delegation with the aim of seeking the leadership of the Government of Mexico City.